The Inch #62 is cloaked in a Connecticut Broadleaf maduro wrapper that looks like it was dipped in oil, and covers a long-filler blend of Dominican and Nicaraguan tobaccos. Flavors of dark black coffee, pepper, and leather mingle with a sweetness that is very tasty indeed. 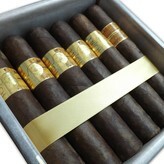 Medium to full in body, the INCH Maduro delivers tons of flavor and sweet sugary bouquet. A good cigar is a joy forever. I’m pretty sure that Mary Poppins said that. This may not be correct, but I like to believe it is. Ernesto Perez-Carrillo is the kind of guy who knows how to make a good cigar, too. He hasn’t been making his own cigars for all too long, but his business in Miami has been, for twenty-five years or so, manufacturing cigars for La Gloria Cubana. He has personally designed many of the most successful cigars that they have sold, and almost everything that they sell is manufactured in Miami at his facility. So when Ernesto set out to make his own cigars, it wasn’t a surprise at all. Indeed, it was the kind of thing that seemed natural, almost surprising that he hadn’t already done it. Ernesto founded his own cigar company, and began to make cigars that he enjoyed, the way that he liked them, making what he would want to smoke. The INCH is the first cigar that he made that wasn’t really something he wanted to make, rather something that the cigar market seemed to be demanding. Big ring-gauge cigars are something that are becoming more and more popular, and because of this Ernesto set out to make a Gordo cigar. Using the Connecticut Broadleaf wrapper, combined with Nicaraguan and Dominican tobaccos, this cigar has deep notes, earthy flavors, and hints of leather, creating a delicious Maduro cigar that any fan of darker cigars will be more than happy to smoke.